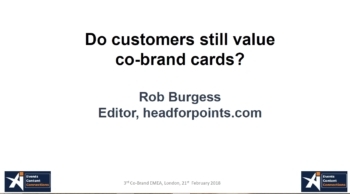 Anika and I were at the UK’s only annual co-brand credit card conference yesterday where representatives from most of the card groups we discuss on Head for Points meet up to discuss what is happening in the industry. Which, at the moment, is obviously quite a lot. If you are interested in seeing what I spoke about – none of which will be a surprise to regular readers – you can download my slides (PDF) by clicking the image below. I would like to be able to say that we came away with an exciting new vision for where the co-brand card market is going, but we didn’t. “No-one knows nuffin” it seems, so far. I am not convinced, partly because I do not feel that interest rate revenue is that high, and because only one card (BA Premium Plus) has hiked its fee. I doubt MBNA would have killed its entire airline product line if the net revenue drop was only 20%. This view only holds water if the card companies ditch their highest spending customers and attempt to sign up more people who pay interest – and there are few of those in the core London business traveller market. One of the longer established co-brand travel cards has just started a root and branch review which is likely to see a substantially changed product emerge. In this particular case it might actually be positive. We may see cards try to reign in costs via benefit cuts (no 2-4-1 voucher?) or caps on points earning – or perhaps staggered earning tiers which reduce depending on how much you charge. Big spenders are now a problem as the marginal miles cost exceeds the marginal interchange fee. The current operating model (airline takes all its revenue via sign-up commissions and a ‘pence per mile’ payment) is broken. Future co-brand agreements should be treated as ‘open book’ joint ventures with a 50 / 50 profit split, with the airline or hotel group having to accept that it is now in the credit card business. Card data needs to become a greater source of value. Apparently American Express has never delivered on the promises of ‘big data’ it made to British Airways. The ability to use card data – perhaps using PSD2 to add data from other cards – must improve. This may involve doing things which seem illogical, eg if the BAPP Amex offered double Avios on all airline purchases – not just with BA – then BA would get a better picture of how much you were spending with other carriers and could act accordingly. ‘Card linked offers’ such as the Avios and Virgin ‘in-store earning’ deals are seen as a valuable source of revenue going forward. (Off the point, but apparently Head for Points is entirely responsible for the many changes to the Virgin / Waitrose in-store deal, because it went so crazy after we originally wrote about it that the budget was blown very quickly and emergency action was required!). The good news is that there was not a major sense of despair in the room. All of the parties have too much at stake. I cannot see any value for many anywhere in this idea unless BA (and others) re-design their status / tier points. Tier points have a (sometimes very) limited life. My partner’s Tier point year ends on 8 July, while mine ends on 8 May. So when we flew in J (PE upgraded with avios) to OAK on 1 July last year, the tier points she earned for the outward leg were of no value at all – they were cancelled a week later. I, though, have kept mine, and will qualify in a months time for bronze on our outward flights from NCL to MAD. Nevertheless, the points earned for the return, as well as those I shall get from LHR-NCE return in April, are all also completely worthless. Equally, status points on a Miles and More flight (LH, LX, SN) at Christmas will often be worthless, as they will be deleted a few days later. Personally, I should like to see Tier Points have a longer life, but more importantly, they should at least be valid on a rolling 12 month basis. For status earned on a credit card to have any value at all, using the card would need to prolong the value of one’s existing points – this would real value, while accruing a few points just a month or so before they get cancelled will be pointless (pun intended). I think that would be an administrative nightmare. People gaining and losing status on a much more frequent basis as TP expired, and new ones rolled in. I think the way they do it is if nothing else game-able. I allowed status to lapse to bronze because I knew flights a couple of weeks later would make me silver, giving me effectively silver for two years, rather than the one year had I moved them a couple of weeks earlier to maintain status. It’s never going to please everyone. I was not suggesting that one’s status should get lost that easily, but having a system where some status points are worth far more than others makes no sense at all if you are trying to sell people an expensive credit card. On due reflection, I think that it cannot make sense for a credit card to issue a few status points – and it is never going to be more than just a few, for the vast majority of people. But if a premium card made it a bit easier to gain or retain status by preventing status points from being cancelled, (just as a standard M+M credit card stops your reward points from expiring, so a premium card could, at least to some extent, stop status points expiring), that could indeed make sense. Interesting point… can BA bring forward the Mrs’s Tier Point year so it aligns with mine? For exactly this reason, I got silver last year and she didn’t. I think you can get a two week extension to hit a status, but no they will not move the actual year. If you (or Mrs) have nothing. Allow to lapse and create a new BAEC club on the more appropriate date? The first time today. There is a Mastercard offering status. Its the HSBC Premier which I got given Etihad Gold from. Why Etihad offer this without Cobranding on the card does confuse me though. Has anyone used Etigad Gold to status match successfully? I assume that you are talking about HSBC Jade, which is invitation only and probably very exclusive. Yep, $1m-$5m of investable assets, that excludes most of us then! I thought the requirement was £500k in relationship assets with HSBC. Still beyond most! I got it with my prorata refund on the card fee. I was indeed offered Jade by HSBC but rejected it as I said to HSBC I thought the Jade website looked like an invitation to join one of Mr Stingfellow’s Gentlemen clubs. Oh no! I turned that down accidentally then…. I should have looked at it first. If we’re being picky, Amex Centurion offer Virgin Gold (which apparently costs them £150 per year per cardholder). These are both very niche products though. Apologies Rob, not trying not to being picky. Just wondering if I can status match my Etihad Gold status to one of the airline alliances. I’ve previously got a match from Etihad Silver to Emirates Silver as an example. Having learned how cheap a crew standby ticket for immediate family members is in CW, it puts the whole thing into a new perspective. On a personal note, as someone without “status” who flies almost exclusively to the US, I try to earn a 2-4-1 which just about makes BA viable once fees, taxes, seat reservation charges, card fees etc are totted up. Otherwise, if I am converting AMEX points I prefer my redemptions on VA because it is simply a better product and the LHR clubhouse is light years better than The Galleries. After that I prefer American because I prefer the daytime return flight from the US and I can choose my seats at the time of booking. After that paying Cash for Norwegian has a better value to comfort ratio than some of the battered worn out aircraft I have experienced this year with BA and it infuriates me that BA don’t participate in the Global Entry scheme. I can only assume that MR Cruz’s business model is working for them so don’t expect any improvement any time soon. OT, I saw BA referred to on the BBC website as the National Carrier. I would like to see them forced to drop the word British from their title. Spanish Consortium Airlines sounds about right. OT but credit cards: Are the amex gold and platinum companion credit card applications subject to full credut checks or is it a soft check like supps? I just got a deferred decision if that means anything. But that is normal for me, I think because I have changed addresses a lot. All my Amex applications, apart from (ironically) my very first, have been deferred. I suspect that they may have taken on a new, but less accurate address database, where the field names do not match with those used for the electoral role. Where I live, there are no house numbers and no street names, but on the application I made two days ago I noticed that street name is a compulsory field. The name of the village was completely left out of the address generated from the postcode (and the only place I could insert it was in the street field), and the name of the house was split between the flat number and house name fields (I do not live in a flat). There is a really bad address database around that SPG use – it does not recognise my postcode and is convinced that I live in a rather rundown part of the town 10 miles away. I had thought that it was just SPG – until I found the same rubbish appearing on a totally unrelated website a couple of weeks ago. Thanks, I’ll give it another month before applying. apologies off-topic but no bits today. I have an Amex Platinum which has the car hire excess insurance as a benefit. Can anyone tell me if I have to pay with the Amex Platinum card and does it matter if I prepay or pay later at the time of completing the rental?